1. What is your instrument, and what do you enjoy most about playing it? I play the violin. 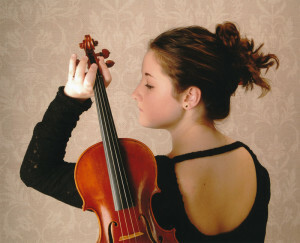 Since I was very young, I have always been enamored by the sound of the violin. 2. How long have you played your instrument? Do you take private lessons? I have played the violin for almost seven years, but it wasn’t until a year and a half ago that I began taking private lessons. 3. How long have you participated in FRYO and what makes it enjoyable? I have participated in FRYO for four years. I enjoy playing in FRYO because I like playing with other young musicians. 4.What is your favorite piece of orchestral music? Currently, Eine Kleine Nactmusik by W.A. Mozart is one of my favorite orchestral pieces. 5. What is the best part about being in FRYO? The best part about being in FRYO is performing a piece for others after I have practiced it for weeks. 6. What else do you enjoy doing in addition to FRYO? Outside of FRYO, I enjoy coaching soccer through Frederick Parks and Recreation, participating in Student Government through my school, and dancing at Bettie Jane’s Center of Dance. 1.Why do you enjoy playing in FRYO?? I love working with an orchestra in general. This is the only orchestra I get to perform with and I’ve fallen in love with all the different colors and emotions FRYO can make by just moving a bow, pressing strings and buttons, and blowing air though an instrument. 2. What is your instrument, and what do you enjoy most about playing it? I proudly play the French Horn and I love the color of the sound and the beautiful music it can make. The warm tone of the horn puts a smile on my face. 3.How long have you played the french horn? I’ve play the French Horn for 8 years, but have only taken lessons for a little over a year and a half. I very much enjoy Strauss: Ein Heldenleben. It has one of the most magical horn solos! FRYO is a wonderful orchestra and I love making music here, there is no where else that I can make music similar to this group. FRYO is the first orchestral group that I have been part of and has broadened my view of music all together. In my “free time” I enjoy making music with other groups, helping with my school’s theater department by being props manager, and, of course, hanging out with friends. I hope one day to become a Music Therapist so I’ve enjoyed taking classes regarding music and psychology at my school. I also support our schools Key club, a service club that exists around the world. I enjoy it because it is an orchestral group that provides extra curriculum in the field of music. I play the bassoon. The thing I like best is the unique role when I play a low melody. 3.How long have you played the bassoon? I have played the bassoon for almost two years. My favorite piece of music is Russian Sailor’s Dance by Reinhold Gliere. The best part is meeting new people who enjoy music as much as I do. Outside of FRYO, I play field hockey and am learning computer programming. 1.What is your favorite piece of classical music? My favorite piece of orchestral music is Scheherazade by Rimsky-Korsakov. 2. Why do you enjoy playing in FRYO? I enjoy playing in FRYO because its nice to be able to play with my friends in an orchestra that is more advanced than my school orchestra. 3.What is your favorite part of being in FRYO? The best part about being in FRYO is getting to play music with my friends. 4.What do you enjoy most about playing violin? I enjoy playing the violin because it is a very challenging instrument with a large repertoire of popular music. 5. When you’re not in school and not playing percussion instruments, what do you do in your spare time? Outside of FRYO, I run cross country and track. I’m also currently working on my Eagle Project in Boy Scouts. A Little Night Music by Mozart, because it was one of the first classical pieces I played. I enjoy FRYO because of the variety of the pieces we play. From classical to jazz to pop, I never know what were going to play next, and I get exposed to many different styles. My favorite part of FRYO is getting together with my friends and just playing music. Everyone is always upbeat and positive, making it an altogether enjoyable experience, and I also happen to be learning about music at the same time. 4.What do you enjoy most about playing percussion? I enjoy percussion because it’s such a versatile family of instruments. I’ve played the snare, the base, the toms, the bells, the congas, the timpani, the tambourine, the triangle, the cymbals, the maracas, the castanets, and even a train whistle, and that’s just scratching the surface! When I’m not banging away at the drums, I enjoy helping my school’s student government, working on my project for the ACE Mentor Program (Architecture, Construction and Engineering) with my teammates and fencing. I also enjoy reading and taking care of the kittens my family fosters for the animal shelter. That is a very hard question, and my answer would change often. I like many pieces because they all bring a different style and emotion. One of my standing favorites is Beethoven’s 7 Symphony, Movement Two. I enjoy playing in FRYO because it allows me to play with other people who have the same interest as me, and I can learn to play in a group and work with other musicians. I love the music that we play in FRYO. I enjoy almost every piece we play and I can learn a lot about different styles of music and playing. 4.What do you enjoy most about playing the clarinet? I originally began playing the clarinet because it has lots of fun, shiny buttons to push. Since then I have discovered other, more sophisticated attributes of the clarinet, but one thing I really like about the clarinet is the rich tone it has. In my spare time I participate in several other activities that keep me very busy. I also love to read and spend time with my family. The finale of the Mendelssohn Violin Concerto is my favorite piece of classical music because of it’s upbeat and light sound that is deceptively easygoing when compared to the difficulty of the technique. I enjoy playing in FRYO because I can share my love with music with my friends while playing with them! Performing in concerts is my favorite part of being in FRYO because it allows us to show the results of our hard work and dedication. It shows the power of hard work and practice. 4.What do you enjoy most about playing the violin? The best part about playing the violin is the repertoire. The immense popularity of the instrument comes from a large base of music that composers created. Violinists such as myself don’t suffer through the fate our colleagues who play violas face; we can easily find music to learn and play. The Frederick Arts Council Promotes Supports and Advocates for the arts in Frederick County, Maryland. © Copyright 2003-2017. Frederick Regional Youth Orchestra, all rights reserved.